Vol.46.5: ARE WE DONE HERE ALREADY? Could we be on the edge of an amazing convergence of faith and reason; one that we never could have expected? Could Al Gore, the new, if second, environmentalist Nobel Laureate, and some Reverend Numbnutz be on the same page? Is the ‘times they are a changin’ catching up with the End Times? Oh, Lordy! The Second Coming of Jesus just might be going to coincide with the Next Melting of the polar ice caps. So the question is: Are we done here, already? Environmentally, or eschatologically, or both? The dinosaurs had a couple hundred million years. Do you mean we aren’t even going to make it to a million? Political opinion surveys are showing that over 60 percent of Americans are fearful of the consequences of global warming. That is a big jump since the beginning of the Bush disaster. While people are still concerned about terrorism they are beginning to wonder whether we might not be terrorizing our own planet. They are beginning to be concerned that an “orange alert” might not mean that that big orange disk in the sky is raising sea levels that destroy coastal cities, creating endless drought, spreading diseases, and generally spelling the end of civilization as we know it (which is not very well). Before Osama bin Laden gets at us we might already be drowned or desiccated by our old friend Helios. The Endtimers have their own, scriptural, view of all of this—the great Armageddon is upon us at last. As they see it, they great battle between Christians and Muslims is already under way and, after the infidel is vanquished, the next step is to convert the Jews (and get back control of the media and banks, of course), and all those who have taken Jesus Christ as their personal lord and savior will be sucked up into the heavenly cumulus. Oh, Lordy! But now these pesky scientists have brought up this exponential business and are using terminology like “tipping points” and “points of no return,” And these scary occurrences might arrive within a decade or so. When they happen there won’t be much of anything we can do to remedy or reverse our dlide down the greasy chute down to the ecological “endtimes.” Those believers in the eschatological endtimes have imagined themselves awaiting their heavenward escalation from mountaintops, but they may be seeking such perches just to keep their feet dry. So here is sort of how I understand the exponent effect. First, take snow, the stuff that covers those polar ice caps, and places like Greenland. Snow is white, and we all know from what color we are wearing—black or white, that a white shirt reflects the sun’s radiation and keeps us cooler. The black shirt absorbs radiation and warms us up. So, as the greenhouse effect melts the amount of snow, more of the darker soil and rock are exposed (the Greenland effect) and the temperature gets an extra boost. The mean temperature rises. Second, and related, earth scientists have discovered that the ocean seabed contains huge amounts of methane gas that remains trapped there as long as the water temperature remains cold. Methane is a major greenhouse gas. However, as the mean ocean temperatures rises this gas will begin to escape, rise and enter the atmosphere, adding to the greenhouse effect and, as we are not beginning to see, the multiplier, or exponent of this process. Third, as these processes result in a furtherance of desertification and the depletion of the rain forests—which are natural processors of CO 2 and expellers of oxygen—the overall effect of global warming is yet further exacerbated. So the very process of warming promotes yet more warming, and the pace of warming accelerates. This means that the potential catastrophic effects of global warming may be far more imminent that we had previously projected. Since these processes re-enforce one another the likelihood of “tipping points” of irreversibility being reached within a couple of decades is enhanced. What the effect of all this warming will be is grim. The consequences of the diseases (such as the advance of malaria into northern latitudes, as just one example), the famine resulting from crop failures and species extinction and other animal die-offs and, to make quicker work of it all the wars that will result from the competition over resources and the enormous population movements, can sum up to no less that the extinction of humankind. This is difficult to imagine for the species that has arrogated to itself the central position and purpose of creation itself. This is where belief enters into the equation. How can there be a God of creation who would accept as his heavenly companions for eternity, such a bunch of selfish screw-ups as the questionably named homo sapiens sapiens ? Perhaps the answer to that is that the religious Armageddon will spare us the ignominy of choking to death on our own effluents. But I’m being too optimistic. Are we done here, yet? Things don’t look promising. 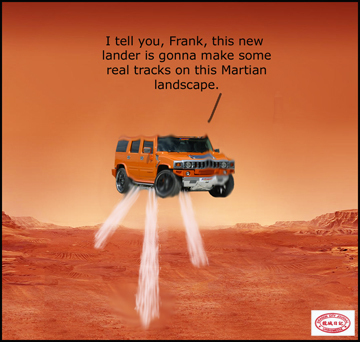 And why is there all this sudden interest in colonizing Mars? Large amounts of methane are also already emitted into the atmosphere out of the back ends of ruminant farm animals, like cattle. The amount of this flatulent gas that is emitted from Republicans is yet to be measured, but is frightening.